Dannielle Rogers has a soft spot … for bears and cougars. 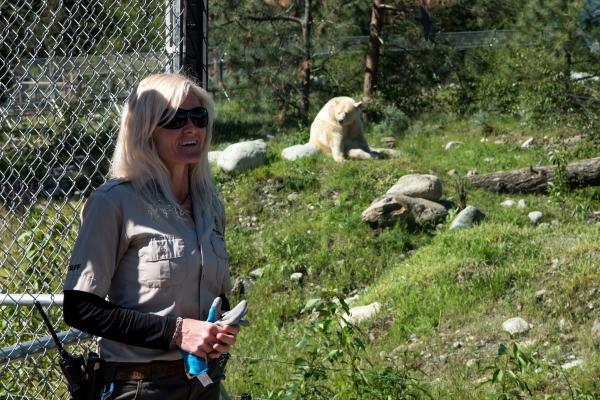 She is a zoo keeper at the BC Wildlife Park and has an especially strong bond with Clover, a six-year-old Kermode Bear that made the BC Wildlife Park his home in 2013. Since the day Clover arrived, Dannielle has been his main keeper. She looks after his needs and trains him five days a week. This important role requires trust - something that takes time, repetition and daily interaction to establish, and as Dannielle explains, building trust took a little longer with Clover. When Clover was ten months old he was either orphaned or abandoned. 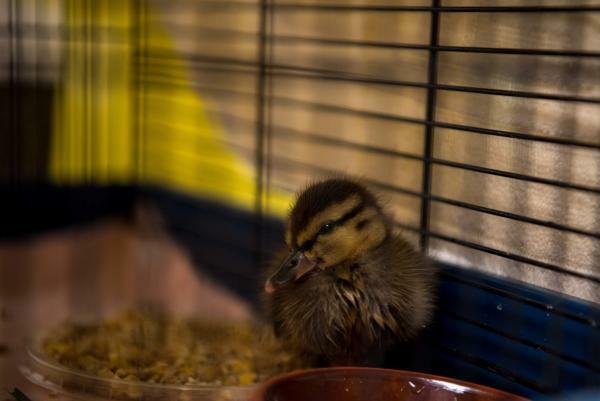 He was picked up by conservation officers and brought to a wildlife rehabilitation centre where he stayed until he was about seventeen months old. He was radio collared and released but shortly thereafter came into human conflict; conservation officers determined he was not a candidate for relocation. At that point he was welcomed to the BC Wildlife Park. Clover has more than two acres to roam in his naturalized enclosure. Bears are typically solitary in the wild and although he may at some point be socialized with the black bears, Clover currently has the whole habitat to himself – just the way he likes it! Food is buried under rocks, inside logs, and up trees so that Clover is inspired to recreate behaviors that are essential in the wild. Vegetation is left in place for foraging. The Saskatoon berries are a favorite but Clover isn’t fussy; he is content to graze on other plants that are native to the area too... like stinging nettle. Kermodes live on the coast of British Columbia, in an area that reaches from Knight Inlet to Stewart. One in ten bears in this region have a white coat in comparison to one in a million in other areas of North America. Often called the “Spirit Bear”, these beautiful coats are a result of a genetic mutation; their population is estimated at fewer than 1,300 worldwide. Never thought you would meet a Spirit Bear? 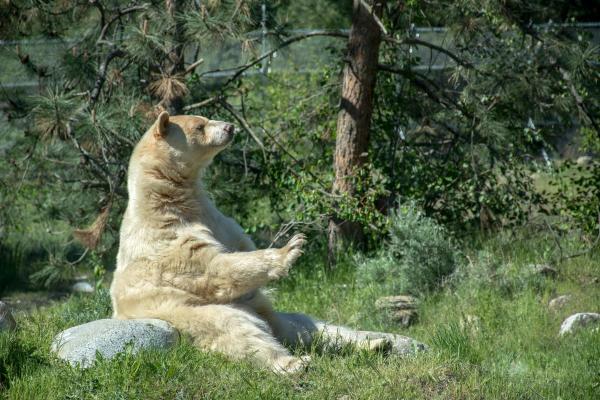 Clover is the only Kermode bear in the world in human care and you can visit him in Kamloops’ backyard. 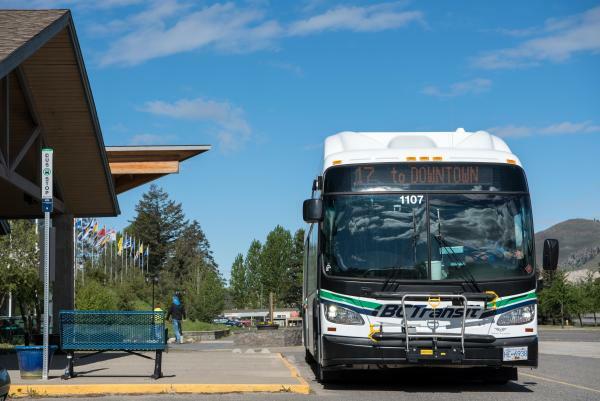 The BC Wildlife Park is open daily (9:30 to 5:00), parking is free and city transit will take you right to the front door. Did you know that the BC Wildlife Park is also home to the Fawcett Family Wildlife Health Centre? The Health Centre was built five years ago and operates as a wildlife rehabilitation centre as well as a hospital for zoo animals. Last year alone 452 animal-patients were admitted. 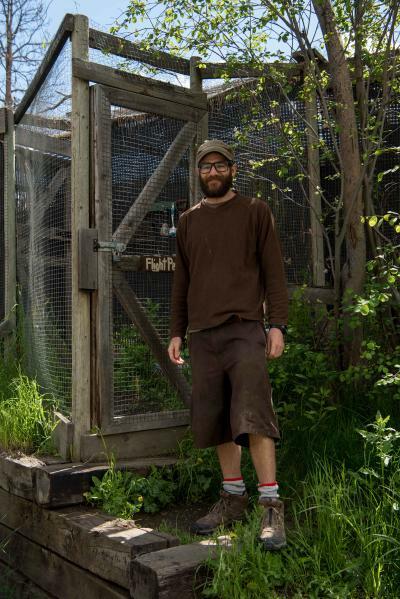 Under the guidance of Thompson Rivers University graduate Sean Daley and with the critical support of several volunteers, the health centre releases between 70 and 80 animals per year back to the wild. 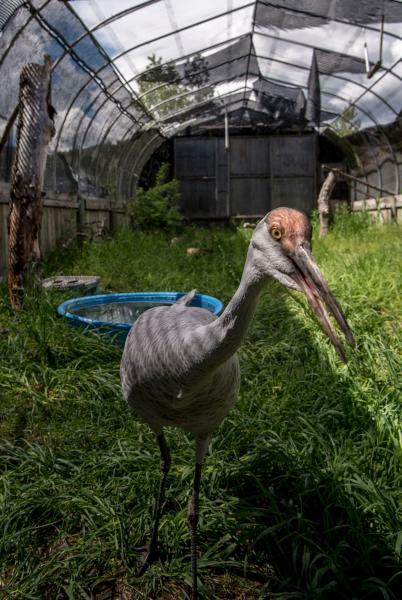 Frasier the Crane is a naturally curious and friendly bird. He earns a reputation for best performer with his daily calls and dances. Frasier loves to eat mice, snakes… and cameras. The smallest and newest patient to the centre weighs less than 8 grams. With all the spring runoff he is sure to have some friends to share his space with soon. 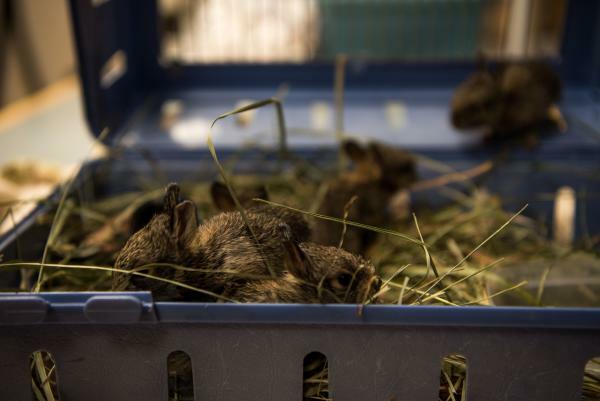 These Mountain Cottontail bunnies are just two weeks old and are already eating grass. They naturally leave the nest between three and five weeks and will be released shortly. 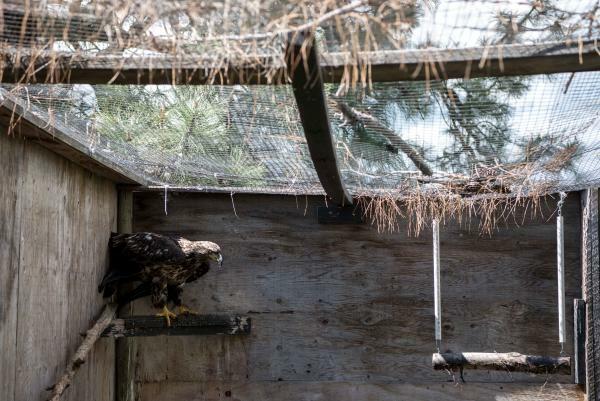 This female bald eagle shares a flight pen with a three-year-old male. 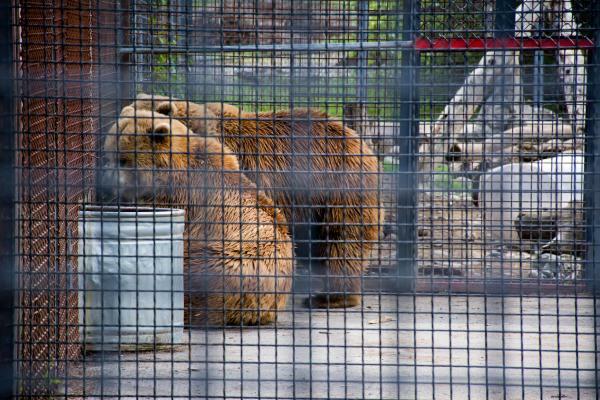 Both have shoulder injuries and will likely take up long term residence at the BC Wildlife Park. Park admissions and donations help fund the care and rehabilitation of these and other animals in the Health Centre.